The mask is cross of Pennywise and a witch. The mask is homemade. Hair is rastafari. Its original color is amber I first stiffened it with a light mist of super 77 then I airbrushed lightly with a fire orange. The hair was also added with clear silicone and a popsicle stick. It is %100 homemade. 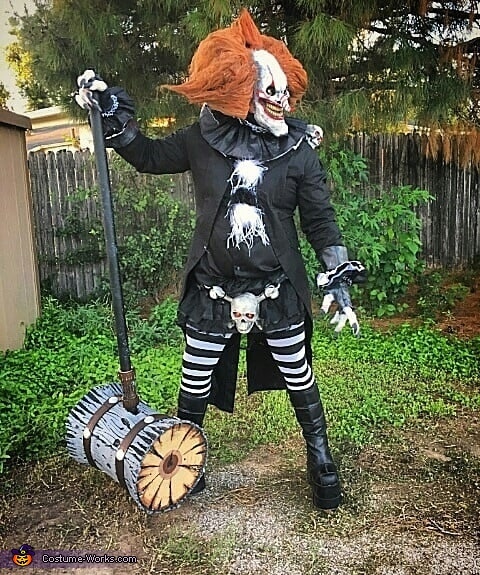 The pitchfork,mallet,severed head, skulls and fingers are all homemade. The jacket is from a garage sale.